One of A-town’s best and brightest lineups, who do their best to revive the funk wherever they may play are back tonight, but for a limited engagement. The Atlanta Funk Society closes down their July gig with the final monday at the Five Spot down in Little Five Points. Be sure and check ’em out with 2 sets of funky as cover tunes. Show begins at 10; Spencer Garn (he of the Soulphonics, and Super Dynamite Express will sit in on keys and liven up the crowd with dj sets before and after. Creative Source – Who is He and What is He to You? WREK is nearing the end of the tremendous task of bringing our station to 100,000 watts, the maximum power level for an FM radio station. (we’re currently at 40,000 watts) Starting on August 15, 2011, we will begin tower work for the upgrade process. Since we have to complete both structural modifications and replace our antenna, listeners should expect some off-air time and reduced power. You may have some difficulty hearing WREK on your radio during this time. We expect the process to take around 4 weeks. Online streaming will NOT be affected, so you can still hear all your favorite shows from anywhere! Once the new antenna is installed, WREK will be coming back as one of the very few college radio stations at the full 100,000 watts with HD Radio and still managed entirely by students. You’ll be able to hear us at a much larger radius and get a better signal in the city as well. Lot’s of really cool events on the upcoming concert calendar. For starters (and sorry this is a little behind, but, hey), the Atlanta Funk Society has been back at their old stomping grounds, The Five Spot, down in L5P, and doing it swell the past couple of Monday nights. This revue has been around the block, but has added some new classics to their repertoire, such as a very jamming version of Stevie Wonder’s Contusion. Old standbys from James Brown, Ohio Players, and Heatwave are still up their sleeves. In addition to the new tracks, they’ve added some new constituents with a full horn section and extended rhythm section, they’re sporting a 10-piece look on stage. The crowd has been pretty hype, too, so hopefully they can parlay it into a more regular gig, as they play out the rest of the Mondays in July. I Feel like there’s tons more to update you on, since its been so long, but my mind escapes me sometimes. Stay tuned to this space for updates and hopefully a posted playlist for this week’s show. Should be a funky good time out in the woods this weekend, folks. 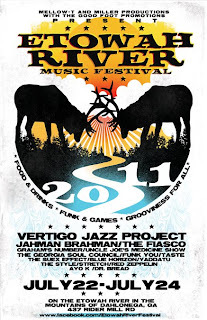 Pull up some campground and enjoy plenty of funk and other live acts at this year’s Etowah River Music Fest near Dahlonega, GA. The festival takes place on the Etowah River Campgrounds, so there should be plenty of space available. Loads of ‘friends of the Boogaloo’ will be in attendance and/or performing as well. Be sure and show your love and support for The Funky Fiasco, Vertigo Jazz Project, Uncle Joe’s Medicine Show and Stretch. Special thanks to the Good Foot Promotions for helping to put this all together. Go here for all the details. And stay tuned to the E-Boogaloo blog. We’ll have some more announcements as well as last night’s playlist posted soon enough. I know it’s been a while, y’all. Hang with us.